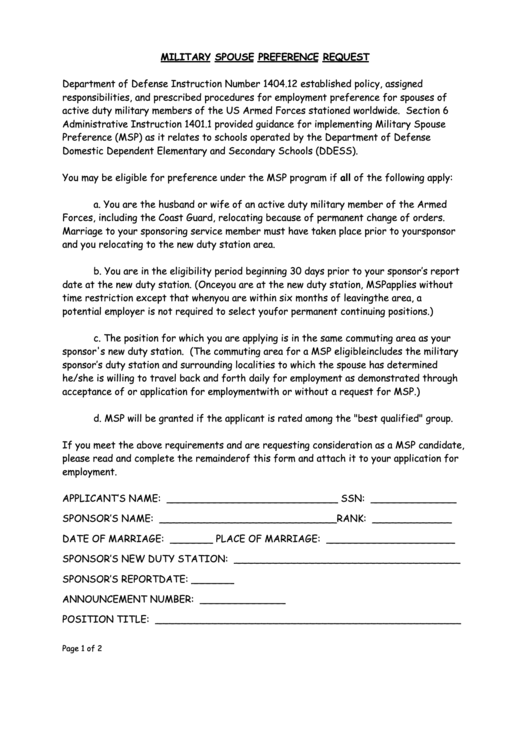 Download a blank fillable Military Spouse Preference Request in PDF format just by clicking the "DOWNLOAD PDF" button. Complete Military Spouse Preference Request with your personal data - all interactive fields are highlighted in places where you should type, access drop-down lists or select multiple-choice options. Domestic Dependent Elementary and Secondary Schools (DDESS). Forces, including the U.S. Coast Guard, relocating because of permanent change of orders. and you relocating to the new duty station area. d. MSP will be granted if the applicant is rated among the "best qualified" group.